The first time I ever tasted idlis was when I was studying in Mt. Abu. We had them at a restaurant just at the beginning of the road towards the lake. Unfortunately cannot remember the name of the restaurant. 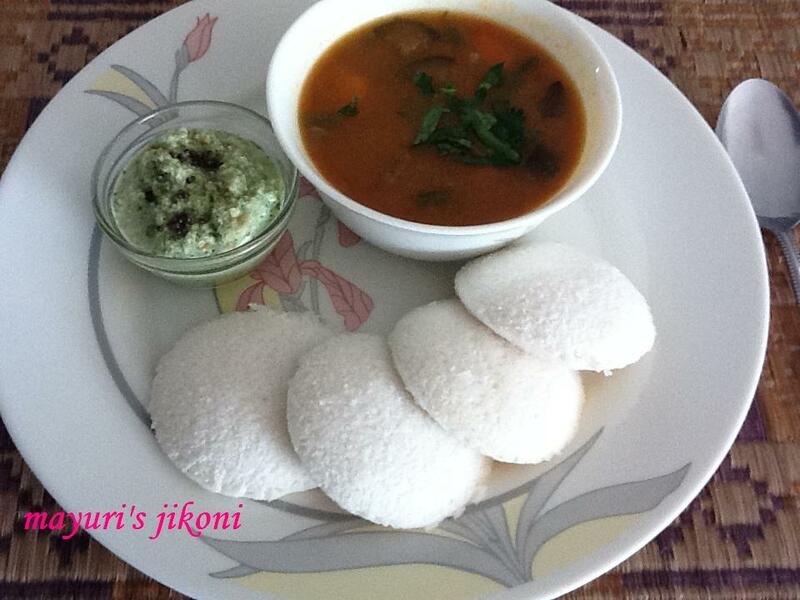 My mum loved idlis and thats what she had day and night when she came to drop my sister and me to school. I never really asked her why she didn’t learn how to make them if she loved idlis so much. When Vibha bhabhi came into our household, she learnt how to make them and that was fine for my mum. The first time I had home made idlis was when Nunu made them. I was flabbergasted at that time as I thought making south indian food is rocket science. I thought wow Nunu is clever. Nunu taught me how to make idlis and dosas along with the sambhar. Her dad at one time use to own a south indian restaurant. Since its difficult to get parboiled rice which is commonly used for idlis and dosas in India, I use normal thick rice and to make them really soft add a bit of eno. In India you normally don’t need to add any leavening agent as the rice makes all the difference. Soak the rice and urad dal separately in warm water for 6 to 8 hours or overnight. Wash the rice and dal separately. First grind the dal in a liquidizer using about ½ cup of water. Pour the paste into a big container. Grind the rice using about 1 cup of water. Pour into the container and mix both the paste very well. Add the methi for idli and mix. The batter should be of thick pouring consistency. Cover and keep in a warm place to ferment for further 4 to 6 hours. It actually depends on how hot the place is. Add the salt for idli and mix the batter very well. Add the ½ tsp eno and mix well. Grease the idli stand with oil. Put some water in a deep pan to boil. Put enough water so that the bottom tray of the idli stand does not touch the water. Pour a ladleful of batter into each idli mould. Put the stand into the pan with the water. Cover and steam for 10 minutes. Remove the stand. Let the idlis cool and then gently remove them using a spatula. This batter will make about 20 to 24 idlis depending on the size of mould you use. Wash and soak the tuvar dal in 2 to 2½ cups of water for half an hour. Put the dal along with the water into a pressure cooker. Add ½ tsp turmeric powder and ¼ tsp fenugreek seeds. Cover and let the dal cook over medium heat for 3 whistles. When its cooked, pass it through a sieve to get a smooth consistency. For mixed vegetables you can take a bit of peas, diced carrots, chopped french beans, chopped cluster beans etc to make up a cup. Cut the brinjal into big chunks. Cut the drumstick into 3″pieces. Put the dal with the remaining water in a pan. Heat it up. Add salt. When it begins to simmer, add the vegetables except the onion. Lower the heat and let the vegetables cook in the dal. To prepare the gravy, heat oil and ghee. Add cinnamon, cloves, peppercorns,urad dal, cumin, mustard and fenugreek seeds. Add asafoetida and immediately add the onions. Stir fry the onions till it turns light pink in colour. Add ginger, chilli paste, curry leaves. Add the remaining turmeric, chilli , coriander cumin and sambhar powders. Stir and add the tomato puree.Add gur if you are using any. Cook the gravy till it becomes thick. Add the gravy to the dal mixture. Stir. Let it simmer for a further 20 minutes. Add the tamarind pulp and fresh coriander and mix well. Put all the ingredients for the chutney except the tempering ingredients into a liquidizer. Blend till the roasted dals are coarse. Take out the chutney into a serving bowl. Heat the oil. Add the tempering ingredients and immediately pour it over the chutney. To serve : Put 3 to 4 idlis into deep dish. Add the sambhar on top. Add chutney onto each idli and serve. If the batter is too thick the idlis will be tough, if its too watery they will not fluff up. So get the consistency right. Thick pouring consistency. Can freeze the batter to make more idlis, dosas, uttapas, white dokhras. Can add whole red chillis if you like when you prepare the gravy. Adjust spices and salt according to your taste. Some sambhars have a bit of gur some don’t. Its your choice. I prefer a bit of gur. Can use diced doodhi, pumpkin if you like in he sambhar. If your family loves idlis, its best to invest in an idli maker. You can make about 24 at one go. If you do not have an idli stand, put the batter in small steel bowls and steam. Remember to grease them. If the sambhar becomes too thick, just add a bit of water. I have added mint in the chutney as most restaurants in Bangalore make the chutney with it. If you want, you can use only coriander. To serve at a party, prepare the idlis ahead. Heat up the sambhar and the dish will be piping hot. Cover the idlis after you have made them.